My husband and mother-in-law teamed up this Christmas to get me a great theme present - aprons! My husband found an ebay lot of vintage apron patterns and my mother-in-law bought me some actual vintage aprons plus a fantastic book called Aprons of the Mid-20th Century: To Serve and Protect. I like the subtitle... This is my first apron made with the inspiration of the book. I used directions from Bend the Rules Sewing as a starting point. It's interesting to see the intricacies and details that went into some of the book aprons - pleats and gathers and tucks and pockets. Some of them look entirely impractical but boy are they lovely! 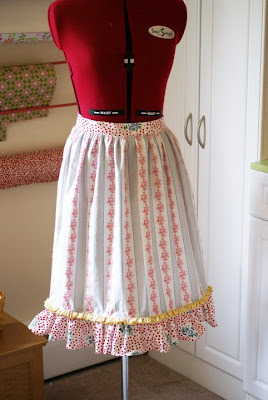 This one should be practical, but maybe I'll have to make myself a totally impractical apron too! Organza and tulle here I come! Keri, your apron turned out so pretty! 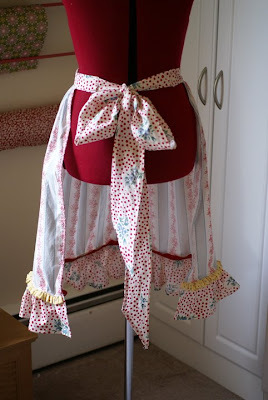 That is one of the things I went to do next, make myself a pretty, frilly, feminine apron. That was such a sweet thing your DH and MIL did. I would love to be able to have a stash of patterns from ebay, LOL! I always get outbid. Your apron is very pretty. I love your choice of fabrics. 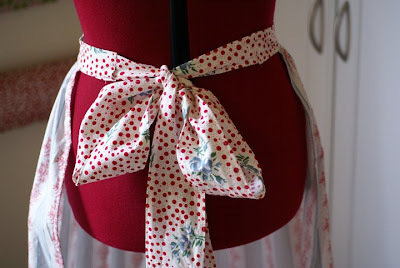 I live in aprons (I have one one now) but I'm afraid yours wouldn't be very practical for me. I have to have a bib and pockets! Oh that is SO pretty!! I would *love* an organza and tulle apron... I think every gal should have one! !